Camp meetings were religious gatherings of North Carolinians who congregated in rural camps for an extended length of time to live and worship together. The events were born out of the spiritual and social needs of a people who lived a basically isolated existence on the frontier and embraced any opportunity to gather in community. They were also a natural outgrowth of the spiritual revivalism that swept through America in the early and mid-eighteenth century. Besides being places of spiritual awakening, camp meetings were also a primary place for politicians to campaign, families to hold reunions, and young people to meet their future mates. The first camp meetings in the United States were staged at the end of the eighteenth century by Presbyterians. Methodists, however, soon became the most influential force in the camp meeting movement, as the concept had great appeal for the itinerant "circuit riders" who welcomed the opportunity to be in community with each other. 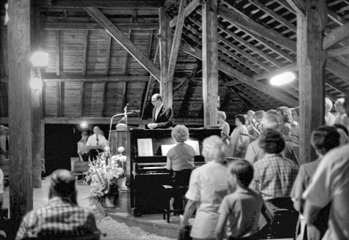 Preaching was the central activity of the meetings, and services were held throughout the day and into the night. Notable North Carolina camp meetings that have early origins include those held at Rehobeth Church in Lincoln County, at Shepherds Crossroads in Iredell County, at Town Creek near Wilmington, and at Wesley Chapel Camp Ground in Catawba County. Although camp meetings were held both in the eastern and western parts of North Carolina, only the western camp meetings had any lasting influence, with the greatest concentration of meetings being in the Piedmont area of the state. Several of these camp meetings remain active. The Rock Springs Camp Meeting in Denver (which sprang from the Rehobeth Church meeting) has met every year since 1829 or 1830. With the exception of the year 1890, Balls Creek Camp Meeting near Maiden in Catawba County has met continuously since it was established in 1853. Both meet in the month of August. Elmer T. Clark, Methodism in Western North Carolina (1966). John James Powell, The Origins and History of the Methodist Camp Meeting Movement in North Carolina (1943). 1 January 2006 | Lepley, Lynne S.